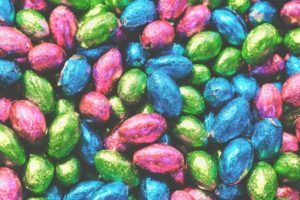 Easter is coming and that often means colourful eggs and chocolates. My challenge to you is to find and add the new chocolate on the block to your Easter repertoire. Please comment and let me know what you find and where. Add this quest to a longer list you create for a fun Easter scavenger hunt race to help you burn off what you find and eat! Some things just go extremely well together; peanut butter and jam, wine and cheese, fruit and chocolate. While the latter has become a common staple in most chocolate these days, there is a new way to tap into your hedonistic desire for flavor diversity. It is also of importance to be sure to allow yourself ‘treats’ in your lifelong healthy living plan. A new generation of chocolate has started hitting the shelves that will allow for our evolutionary desire for taste variety, while potentially saving us calories and offering other health-promoting benefits. As we know, for most, eating is often an experience that involves a multitude of sensory perceptions from different tastes to an accompanied visual palatability. In order to feed our many needs, desires and senses, we must embrace different sources of stimulation. What we also know is that each of us has diverse taste perceptions and if we want to offer another way for people to indulge in the goodness of chocolate, we must have another way. Cocoa, which should be the staple of a good quality chocolate source, is rich in polyphenols, flavanols, lipids, minerals and sterols. These composites have shown that they may have healing capabilities as well as having health-promoting properties as a means of antioxidants, anti-inflammatories and even antiatherogenic capabilities. This basically means that cocoa may be good for your heart and vasculature. Herein is where the ruby bean steps in. The ruby bean, being used to delight the desires for chocolates benefits offers a delightful fruity taste and pleasant color, both of which are naturally occurring, in other words, no funky ingredients are required that could compromise your health. This new food product also has the potential to cut some calories for that desired flavor combination so many love of sweet fruit and chocolate. This pleasantry may be attained without having to add any additional dried fruit which can contribute to a higher sugar and calorie count then is needed. We are typically creatures of habit. This can be a good thing but can also lead us into trouble. There is a number of evidence showing that diversity is good for us on many levels. We should embrace this with all of our senses in what we consume. If you are a natural seeker of newness, great, here is your chance to get on board with something new. For those of you stuck in a constant habit with little divergence, it is time to re-stimulate your senses with a colorful new way of enjoying chocolate. With all of the aforesaid, it is important to know that calories still count in your overall health plan. Heavenly chocolate can be a part of your life even if you are seeking fat loss. While this is true and indulging in things like ruby chocolate may help satisfy certain ‘needs’, it does not mean that eating mass amounts of chocolate rich in even ruby cocoa is the cure-all. Having a few portions to soothe your cravings seems to be a solid strategy to get some nutrients while staving off feelings of guilt while trying to transform your health. Green, E. (2017, Oct. & nov.). The Dawn of Ruby: New Chocolate Experiences. The World of Food Ingredients, 26-28.